Reagan is made from a fuzzy pink material covered in blue spots with hints of purple. She has large sparkly pink and black button eyes and a glittery pink nose with pink stitching for her mouth. She has a white muzzle and belly with purple ears. The inside of her ears are made from a shiny pink fabric. And when I pick friends, I pick you! Reagan was introduced in September 2015. Her birthday is on 13th November. This is the medium 9″ version of Reagan. 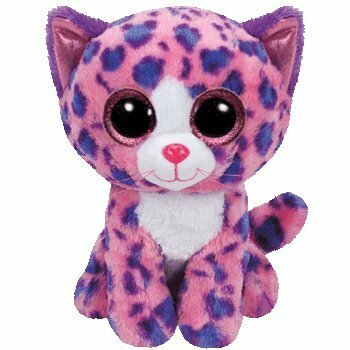 She was also released as a small 6″ Beanie Boo, in a large 16″ size and as a key clip. Reagan is a Claire’s exclusive Beanie Boo.